The Graphic Design is a creative job, which requires a powerful specification laptop to handle all the heavy graphics design software like Adobe Photoshop, Adobe Illustrator, Adobe InDesign etc. The reason is a lower configuration laptop can’t able to handle all these software properly. The best thing is that nowadays you will get a laptop for a specific use but the important thing is that choosing the perfect machine is not an easy job. Actually, a high-config gaming laptop is also you can use for graphic design because the requirements of both the laptops are almost the same. So one of the best thing is that if you are a gamer then a single laptop can satisfy your both the needs. To make your laptop selection task simpler our laptop expert team has done so many research to find the perfect laptop for graphics designing work. So now you just have to do is choose the laptop as per your need and budget. Before we move towards, we need to clear one of the most important things. Which is if you are planning to buy a high-config laptop for just creating social media graphics then you don’t need to do that it is because you can do that on any ordinary laptop. Well, let’s back to the topic. So here in this article, we will give you a proper buying guide for buying the best laptop for graphic design. If you want to understand properly on which thing you need to consider while you are going to buy a laptop for graphic design then we suggest you just go through the below things. As a student, we don’t recommend to buy a MacBook because it is costlier than the Windows laptop. But if you have a good budget or the software you will use which support only Mac OS then go with MacBook. For the graphic design, as a student, we suggest at least to go with the latest 8th generation Intel Core i5 processor laptop. But if your budget is good or planning to use a laptop for a long run then we recommend 8th Gen Intel Core i7 processor laptop as it provides you a great performance than the i5 processor laptop. RAM is one of the most important part for a smooth multitasking experience, so here we suggest to go for at least 8GB of RAM for a student. But again if you are planning to use a laptop for a long run or if you are a pro then recommend you to go for 16GB of RAM. For a graphic design laptop having a dedicated graphics card is a must as it provides better graphics visual and also it improves the overall performance of the laptop. For the display we suggest you to go for at least 15-inch of a display with full HD resolution, which delivers better colors and combination. But if you will buy a 13-inch laptop then you can’t able to do your work comfortably as a 15-inch laptop. If budget is not a concern for you and you like a bigger display then the 17-inch of a display is the good option to do your work more comfortable with better details. So these are the most important things which you need to check and hope now you properly understand how to choose the best laptop for graphic design. If you will buy any of the below laptops then you no need to check all those things because our laptop expert team has done all the research. You just have to do is choose the best laptop as per your need and budget. This Acer Predator Helios 300 is our top choice because it gives you more and cost you less than that. It is the best selling laptop on Amazon like its predecessor, which is a good thing. If we talk about the design of this laptop then the chassis of this laptop is in metal with sporting red accents gives an amazing look. This laptop is a good option for those who are looking for a gaming laptop, which can use for both graphic design and gaming. It is powered by the latest and powerful 8th Gen Intel Core i7-8750H 6-Core processor with turbo boost technology up to 4.1GHz. To handle multitasking of this laptop it is backed by 16GB of DDR4 RAM, which is good enough to deliver you a smooth working experience without lag. For full throttle gaming acceleration it is equipped with the powerful overclockable NVIDIA GeForce GTX 1060 graphics with 6GB of dedicated memory. For the storage, it has got fast 256GB SSD which helps to accelerate boot-up times and shorten in-game loading times. 256GB of storage space may disappoint you but it allows you to upgrade through its extra empty accessible slot of 2.5-inch for a hard drive or SSD. The display of this laptop is 15.6 inches of full HD IPS Widescreen LED-backlit that provide consistent, brilliant color from any perspective. While an intense gaming or working session to keep the system cool and stable, it has all-metal AeroBlade 3D fans which offer advanced aerodynamics and superior airflow. The battery backup of this gaming laptop is decent, which lasts for up to 7-hours on a single charge. Few worth mentioning feature of this laptop are its iron red backlit and Acer TrueHarmony and Dolby Audio Premium. As a student, not everyone has a big budget so for those students Acer Aspire E 15 is the best budget laptop for graphic design. One of the best things about this laptop is since it is launched this is the best selling laptop on Amazon. It has got 15.6-inch of full HD IPS LED-lit widescreen display, which delivers accurate colors from a wide viewing angle. 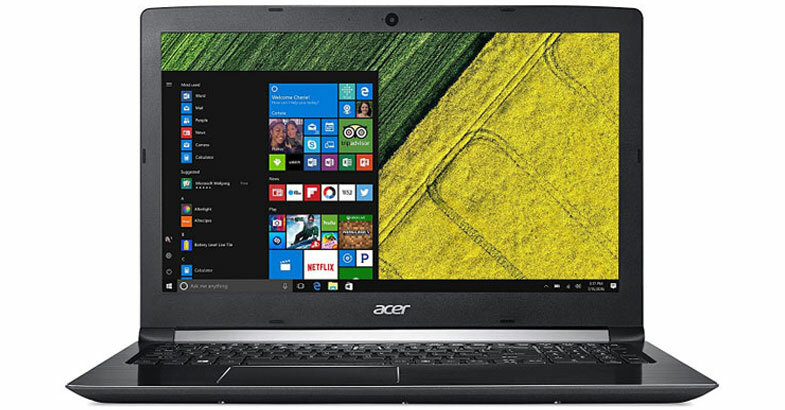 This Acer laptop features with latest 8th Gen Intel Core i5-8250U processor which provides more power, more battery life, and more high-quality entertainment. To provide smooth performance this laptop is equipped with 8GB of RAM and 2GB of NVIDIA GeForce MX150 dedicated graphics card. This laptop runs on the Windows 10 operating system and got all the required ports and slots. The thing which makes it an ideal in this list is its battery life, it provides up to 15-hours of battery backup on full charge. This Acer Aspire E 15 is the perfect combination of performance, fast wireless with new MU-MIMO technology and great battery life which makes it shine in any situation. This MSI CUK GP63 Leopard is from MSI who builds dedicated gaming laptops only. So if you are planning to buy a gaming laptop from a dedicated gaming laptop company then this is the best option for you. And this gaming machine comes with all the latest and powerful set of hardware configuration. It has got 15.6 inches of full HD Anti-Glare display with 1920 x 1080 pixels of resolution. And its anti-glare panel will never irritate you from the glare during you are working on your projects or playing games. Let’s talk about the specs of this laptop, it has inside newest 8th Gen Intel Core i7-8750H Six-Core processor with 9MB Cache and turbo boost up to 4.1GHz. To handle today’s graphics-intensive games it is powered by the mammoth 6GB of NVIDIA GeForce GTX 1060 dedicated graphics card and paired with 16GB of RAM. Thanks for providing dual storage such as 500GB NVMe SSD + 1TB HDD, which is good enough space to store all your software, games, movies, images, etc. And its NVMe SSD is 4-times faster than the SATA SSD. The keyboard of this device is a full-size Steel Series full-color backlit keyboard, which is specially designed as per professional gamers needs. It comes with 1 x USB 3.1 Gen 2 Type-C, 2 x USB 3.1 Gen 1, 1 x USB 3.1 Gen 2, 1 x HDMI, 1x mini DisplayPort, 1 x headphone out, 1 x microphone in and 1 x microSD card reader for the connectivity. 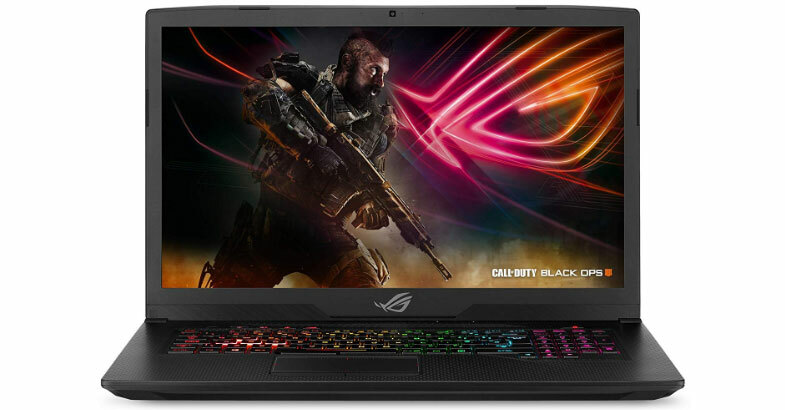 The reason behind to recommend ASUS ROG Strix Scar Edition laptop is it comes with a bigger display with a powerful set of hardware configuration, which gives you an amazing working and gaming experience. 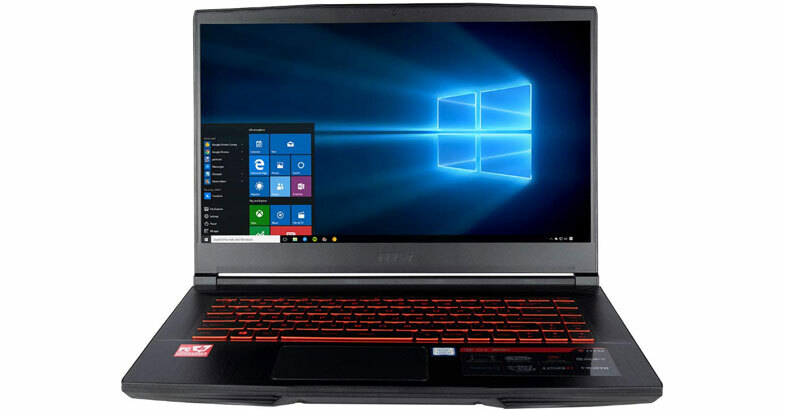 You may be thinking that why we have added gaming laptops in this list but as we have mentioned before that the requirement of graphic design laptop and gaming laptop is similar. This gaming laptop has got big 17.3 inches of full HD IPS LED-Lit display which provides accurate colors from a wide viewing angle. 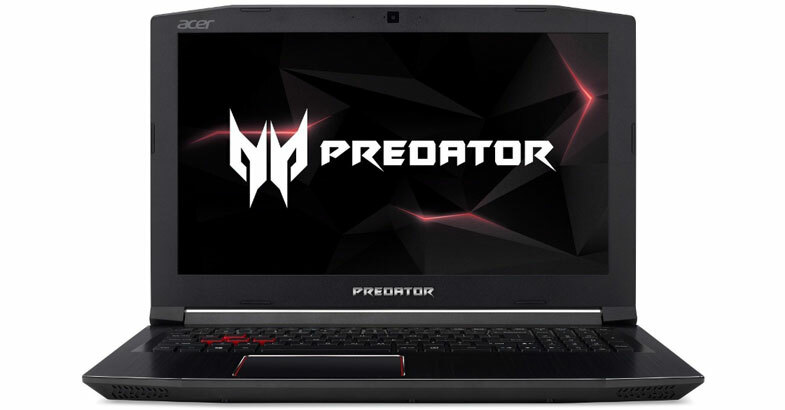 This 17-inch gaming laptop provides powerful gaming performance with 16GB of RAM and 6GB of NVIDIA GeForce GTX 1060 dedicated graphics card. It has got 8th-Gen Intel Core i7-8750H processor which gives a boost in performance over its previous generation quad-core processors by 23%. For the storage, it comes with 256GB of SSD + 1TB of FireCuda Hybrid Drive, which is an ideal combination of OS drive speed and storage capacity. And its FireCuda Hybrid Drive is up to 5-times faster than the traditional HDD drive. It has an exclusive design that forces dust and debris to exit from the chassis through the fan module’s two anti-dust tunnels, which keep the device cool and stable during heavy multitasking work. If you are a gamer then its AURA SYNC RGB-Enabled backlit keyboard gives you full gaming experience. Finally, the Dell laptop is here and the Dell has launched the G series laptops especially for gaming and this Dell G3579-7989BLK-PUS comes from that series. This Dell laptop finished in black metal with a blue accent which gives premium look and feels. And the best thing is that you can use this Dell gaming laptop at your school/college or at your workplace because the look of this laptop is not gaming. It provides sharp visuals from virtually every angle on its 15.6-inch of full HD Anti-Glare LED-Backlit display with IPS technology. To play games at higher settings with crystal-clear graphics detail and smooth, realistic gameplay for a more immersive on-screen experience it is equipped with 4GB of NVIDIA GeForce GTX 1050TI graphics card. To handle CPU-intensive graphics projects this laptop comes with Intel Core i7-8750H processor and coupled with 16GB of DDR4 RAM. To store your graphic design software and games it houses with 256GB SSD + 1TB HDD drive which ensures faster performance and better reliability. It has a dual fan cooling system that helps to keep the system stays cool and let you experience uninterrupted gaming. To light up your game clearly in the low-light condition it has a backlit keyboard. This device is powered by the Waves MaxxAudio Pro to deliver superior sound with two front-firing speakers. 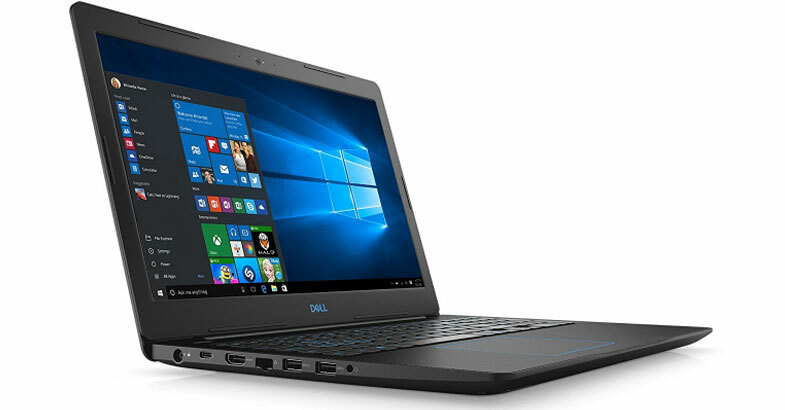 Overall, if you like the Dell laptops as it is one of the most trusted laptop brands then this machine is the best choice for you which you can buy right now. 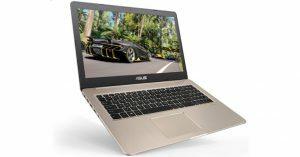 This MSI CUK GF63 8RD is another laptop from MSI in this list and it is a part of the new breed of aesthetically pleasing thin and light gaming laptop. If we talk about the design of this device then its hair brushed aluminum and the X-Vented underside gives this gaming laptop the perfect balance between design and performance. It has 15.6 inches of full HD IPS display which brings true-to-life visuals and producing brilliant clarity and contrast. And also delivers a clear view from any angle along with an immersive thin bezel experience. If connectivity is your main concern then it has got all the essential ports and slots. 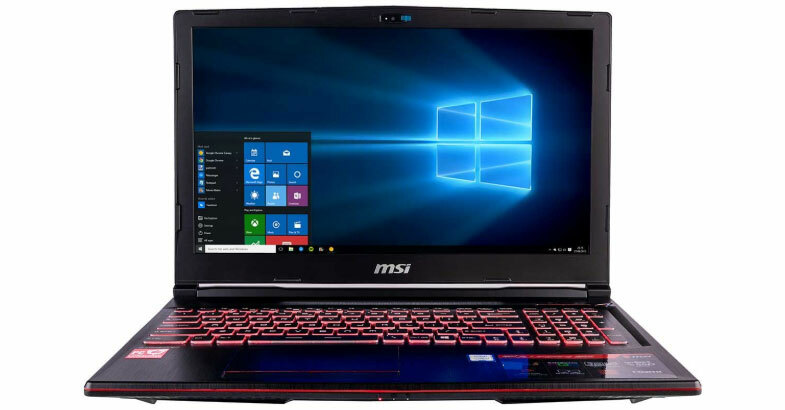 This MSI laptop is powered by the newest 8th Gen Intel Core i7-8750H Six-Core processor and paired with 16GB of DDR4 RAM, which is a powerful config to deliver lag-free performance. It is backed by NVIDIA GeForce GTX 1050TI graphics with 4GB GDDR5 VRAM, which turn a laptop into a true gaming rig. This device runs on the Windows 10 operating system and got 500GB of SSD drive. If you are looking for a laptop with a business look and powerful configuration for graphic design work then this Acer Aspire 7 laptop is a perfect match for you. As per the look it has got no one can tell that this a gaming laptop but its internal has proved that. It sports 17.3 inches of full HD IPS WLED display which delivers stunning visuals from all angle. This Acer laptop runs on the Windows 10 operating system and powered by the 8th Gen Intel Hexa-Core i7-8750H processor with max turbo frequency 4.10GHz. Graphics of this device is handled by the 6GB of NVIDIA GeForce GTX 1060 graphics with Max-Q design. To deliver smooth and fast performance, this laptop comes with 16GB of RAM and 256GB Solid State Drive. The battery life of this laptop is also good which provides up to 6-hours of battery backup on one-time charge. The keyboard of this laptop comes with Numpad and backlit which helps to do work comfortably in any situation. For the connectivity it has includes 1 x USB 3.1 Gen 1 Type-C, 1 x USB 3.0, 2 x USB 2.0, 1 x HDMI 2.0, 1 x Headphone/Microphone Combo Jack. The only cons of this laptop is its 256GB of storage space which is not enough but besides this overall, this is the best laptop in this budget segment. If you are a traveler and looking for a thin and light laptop for graphic design work then this ASUS VivoBook Pro is the best option for you. This thin and light laptop has all the latest and powerful specs in just 0.8” thin profile which weighs 4.85 pounds only. If we talk about the display of this device then it sports 17.3 inches of full HD Wide-View display which provide crisp & clear visuals. And its ASUS Splendid software enhancement delivers richer, deeper, and more accurate colors for any kind of content. This 17-inch laptop features latest 8th generation Intel Core i7-8565U processor with turbo up to 4.6GHz. For smooth and effortless multitasking experience this notebook is backed by 16GB of DDR4 RAM. Thanks for providing combo storage segment such as 256GB high-performance SSD + 1TB huge HDD. If you are concerned about the graphics of this device it is equipped with NVIDIA GeForce GTX 1050 graphics with 4GB of dedicated memory. To deliver an immersive audio quality it has powerful speakers with smart amplifier technology which helps to maximize volume while maintaining crystal-clear sound. A few worth mentioning feature of this laptop is its fast-charge and cooling technology. All in all this ASUS VivoBook Pro 17 comes with all the multimedia essentials wrapped in a stylish package. 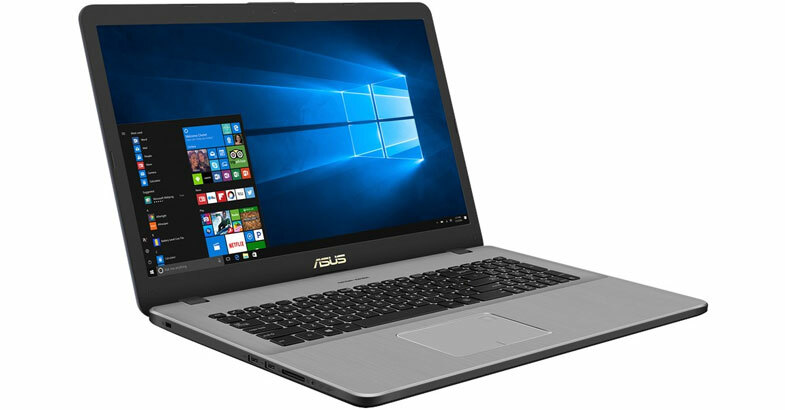 Note:- If you like the above ASUS VivoBook Pro thin and light laptop but you want 4K display with powerful config then this ASUS VivoBook Pro N580GD-XB76T is good option for you. But it will cost you more than the above VivoBook Pro. This ASUS VivoBook comes with 15.6-inch of 4K Ultra HD WideView touch display with 3840 x 2160 pixels of resolution, which provides stunning visuals. This portable notebook is powered by the powerful 8th Generation Intel Core i7-8750H processor and coupled with 16GB of DDR4 RAM. The graphics of this notebook is managed by NVIDIA GeForce GTX 1050 graphics with 4GB of VRAM. To fulfill your storage needs it has got 512GB of SSD drive. A few interesting features of this laptop is its fingerprint sensor, dual-fan cooling system, and fast-charge technologies. 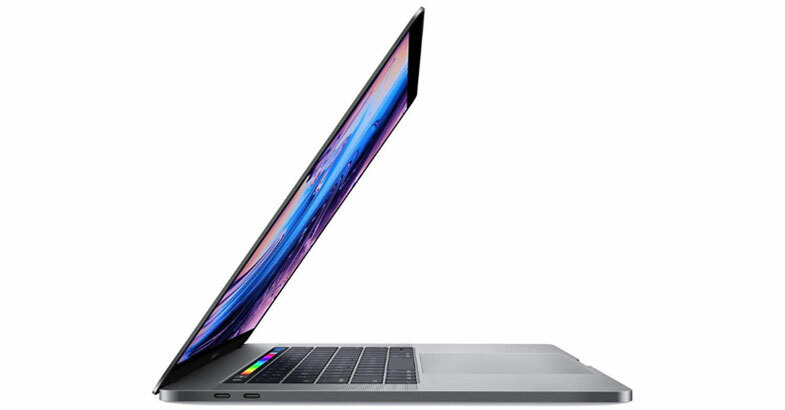 We have added this Apple MacBook Pro 15 in this list for those who are planning to buy a MacBook or for those who use the software which supports Mac only. Here we don’t talk about the design of this notebook because almost we all love the look of the MacBook. This MacBook has got 15.4-inch of diagonal LED-backlit IPS Retina display with 2880 x 1800 pixels of resolution. This latest model is powered by the 6-core 8th-generation Intel Core i7 processor with 9MB shared L3 cache and max-frequency up to 4.1GHz. For a faster performance during working on a large graphics files or running multiple applications at a time, it is housed with 16GB of RAM and 256GB blazing fast SSD drive. This 15-inch MacBook Pro equipped with AMD Radeon Pro 560X graphics with 4GB GDDR5 memory, which delivers an eye-opening graphics visuals. If we talk about its touch bar feature then it automatically changes the functions key based on what application you are using and shows you relevant tool. The best part of this MacBook Pro is you can unlock this device within a moment by at your fingertip only. One of the best thing about the MacBook is its battery life and this device provides up to 10 hours of long-lasting battery backup. 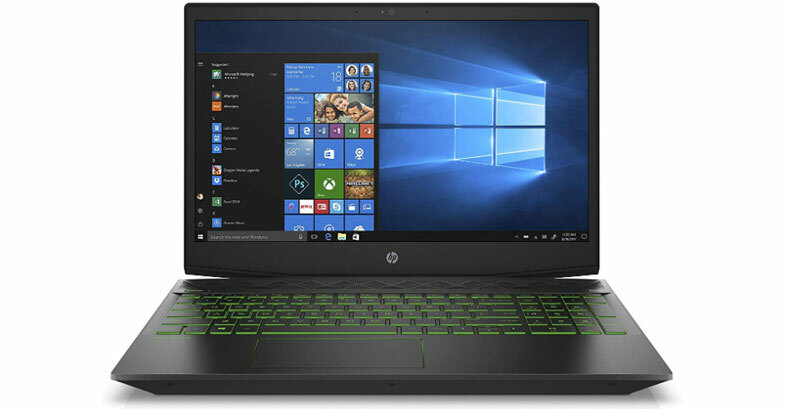 This HP Pavilion 15-cx0045nr laptop has got black metal finished chassis with acid green accents, which gives an attractive look to this gaming laptop. It comes with 15.6-inch of full HD IPS anti-glare WLED-backlit display with Narrow bezel, which gives an amazing viewing experience. And its anti-glare screen will never distract you from the glare while you are working on your graphics projects or anything. For serious gaming graphics and performance, this HP laptop is equipped with NVIDIA GeForce GTX 1050TI graphics with 4GB dedicated memory. It comes with latest 8th Gen Intel Core i7-8750H processor with 2.2GHz base frequency and turbo boost up to 4.1GHz. It houses with huge 1TB HDD drive to store all your software and projects, which is more than enough space. One of the interesting things about this laptop is, the storage of this laptop is paired with 16GB Intel Optane Memory that helps to short boot times and load application fast. 16GB of RAM it has got to handle multitasking on this device effortlessly. The battery life of this HP gaming laptop is quite good, which provides up to 9 hours of battery backup on full charge. For a rich audio experience, its front-firing HP dual speakers are tuned by B&O PLAY. It has a full-size distinct acid green LED backlit keyboard, which keeps you productive even in a dark place. Every single laptop listed above has been handpicked by our laptop experts team with the proper guidance from a graphic designer. All the above-listed laptop has earned a place with its overall performance in this list of best laptops for graphics design students. Before you choose any of the laptop first go through all the short review of the above laptops and then choose the perfect one which is perfect as per your need and budget. Still, if you are struggling to choose the perfect laptop for your self then feel free ask us by just drop a comment below. Robbie Smith is a senior editor of this All Budget Laptops blog. Along with the laptop expert team, he is helping people in finding the best laptop in all budget.